Don't let the budget price fool you on these Hammercraft grinders. Although they are not quite a finely crafted as other brands we carry (such as SweetLeaf), they definitely get the job done. 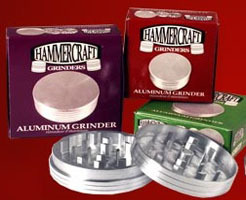 All Hammercraft grinders are solid aluminum construction and come in both silver and black. They can definitely take a beating, and are the perfect grinder for the budget-conscious connoisseur who is more interested in getting their grinding done, rather than having it look like art while they're doing it. The "Large" size is 3.0" in diameter and this is grinder only with no storage compartment.